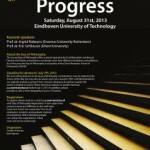 In collaboration with the OZSW, Eindhoven University of Technology is organizing the 34th Dutch-Flemish Day of Philosophy, taking place on 31 August 2013. Key note speakers are Ingrid Robeyns and Eric Schliesser. For more information see https://www.ozsw.nl/34th-dutch-flemish-philosophy-day/. Please register if you plan to attend by sending an e-mail to s.a.voerman@tue.nl with “Day of Philosophy Registration” in the subject line and in the mail body: your name, your affiliation, and whether you are a senior researcher, PhD student or Research Master student. Costs (incl. lunch) are covered by TU/e for all employees, students, and graduate students of universities. Other interested people can contact the organization. Travel costs will not be reimbursed.